This collection of rotisserie chicken recipes will save you time in the kitchen! 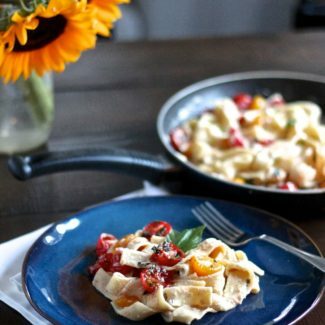 These recipes are perfect for nights when you don’t have much time to get dinner on the table. 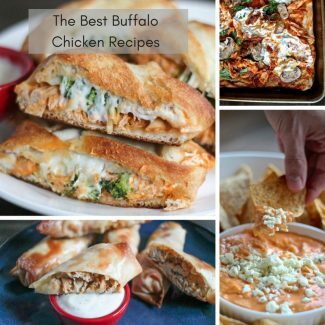 I’ve got a mix of snacks, lunches, and dinner recipes that can be whipped up in 25-45 minutes. 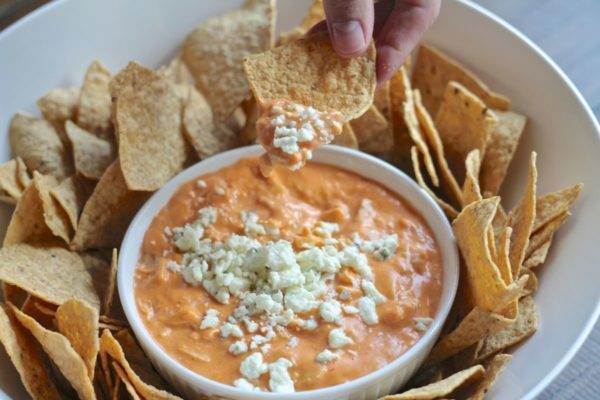 If you want a snack, indulge with a Creamy Buffalo Chicken Dip with a kick of spice. 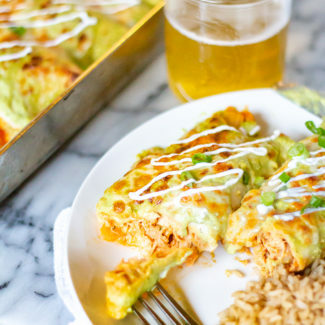 This is the perfect thing to snack on while you watch Sunday Football … or binge watch Netflix. It’s easy to adjust the spice level of this dip from mild to hot based on your own personal preference. Mixing buffalo sauce with barbecue sauce results in a magical sweet and spicy sauce that can be made to dress a Buffalo BBQ Chicken Pizza. 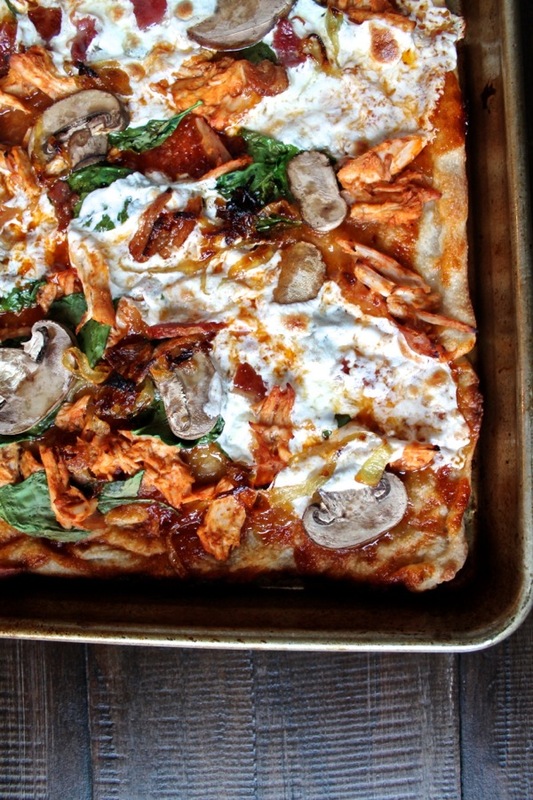 This pizza it topped with caramelized onions, mushrooms, spinach, mozzarella, and rotisserie chicken, and it is one of my favorites. Only have five minutes? 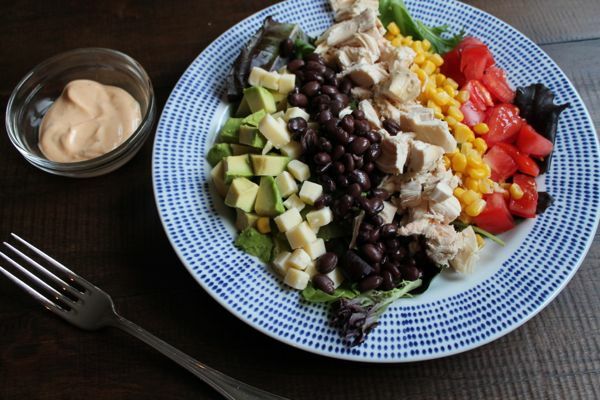 Make this 5 Minute Southwestern Chicken Salad that is loaded with vegetables and protein, and can be packed for lunch. 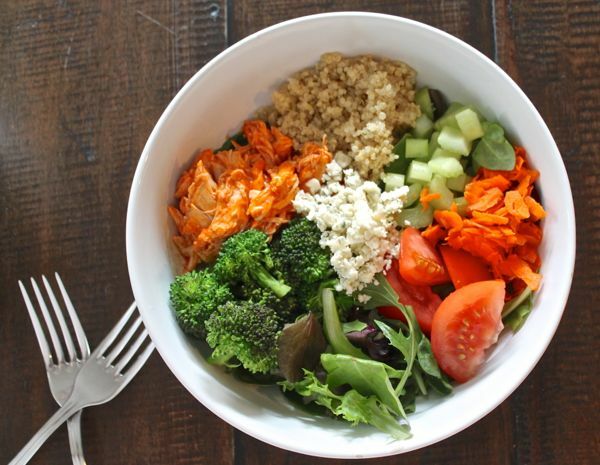 I’ve got one more buffalo chicken recipe for you, because I am obsessed – you can prepare Buffalo Chicken Quinoa Salad in just 20 minutes and it is full of veggies and fresh flavors. 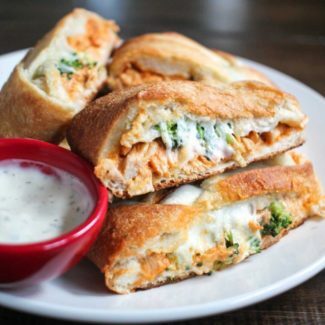 The buffalo sauce acts as the dressing while the blue cheese tones down the spice level. 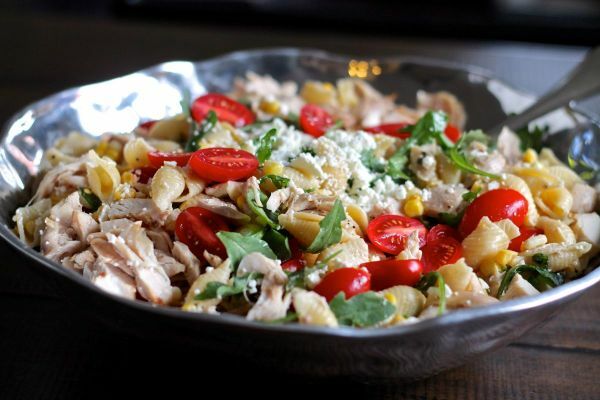 Lemon Garlic Pasta Salad with corn, tomatoes, goat cheese, and arugula is a lunch that tastes like summer. I think that farro is the new quinoa – it’s nuttier and heartier. 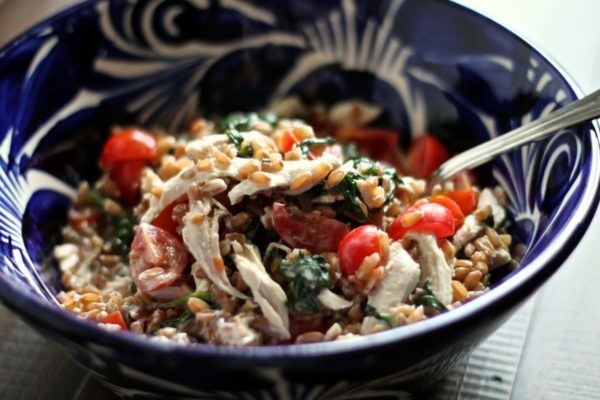 This Chicken, Goat Cheese, and Spinach Farro Salad is one of my go-to lunch recipes and it can be made in big batches and packed for lunch throughout the week. If you want something a bit more filling, Lemon Goat Cheese Pasta with Rotisserie Chicken is a full meal that can be made in just 20 minutes. 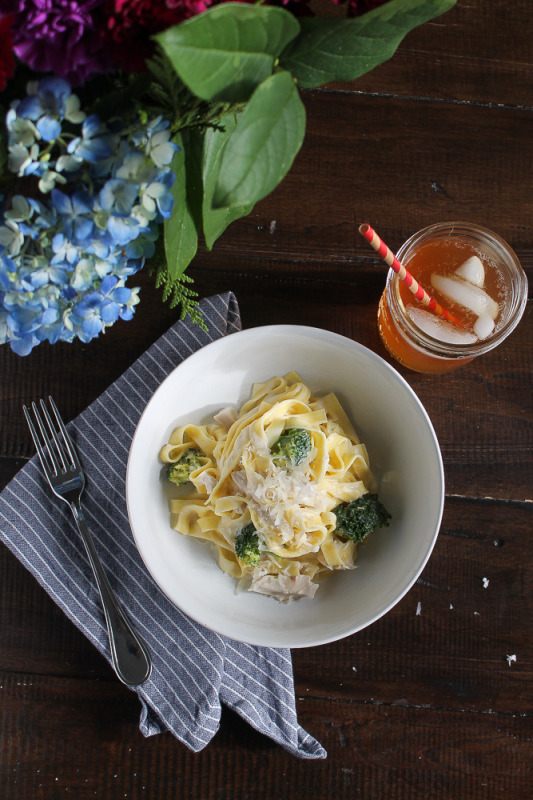 Diced rotisserie chicken and broccoli are served over tagliatelle with a creamy lemon goat cheese sauce. 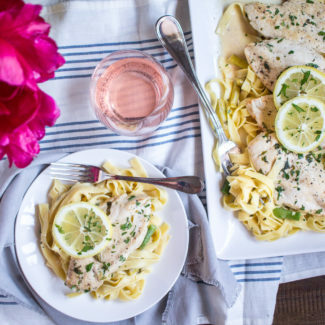 It’s a satisfying weeknight meal. 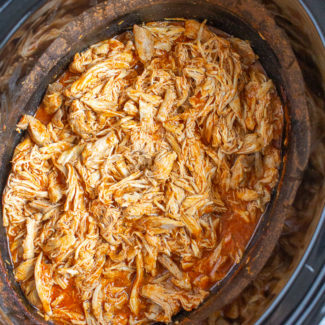 Do you have any favorite recipes made with rotisserie chicken? Share them in the comments!